Very nice property and very central for business area, nice to have more than one room. Great location - the palace in 5 minutes away, 3 tube lines available, a nice and scenic place. Great bed, decent facilities. Location and the amount of living space in the one bed apartment compared to most London hotels. Great value too. Easy access to underground. Had everything and more we could have wished for. I will not hesitate to return the next time we are in London. Excellent location, atmosphere, little things as shopping bag, complimentary cell phone with free data and local/international calls package and many more. The property is very well located, clise to the Piccadily line. Its quite spacious, has elevator. Lock in a great price for 44 Curzon Street by Mansley - rated 8.7 by recent guests. Dating back to 1908, 44 Curzon Street is situated in the heart of London, within 10 minutes' walk of Buckingham Palace, Hyde Park and Green Park Tube station. A digital TV with English and foreign channels is provided in each studio and apartment, along with free WiFi, self-catering facilities in the fully equipped kitchens and a maid service from Monday - Saturday (excludes public holidays). 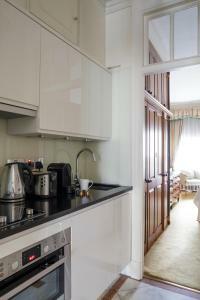 Front desk staff can arrange personal laundry, as well as organise theatre tickets, dinner reservations and car hire. London's West End is just a 15-minute walk away, along with the shopping district of Oxford Street and vibrant nightlife of Soho. Direct services to Heathrow Airport can be taken from Green Park station and take just under an hour. This is our guests' favourite part of London, according to independent reviews. This area is also great for shopping, with popular brands nearby: Cartier, Ralph Lauren, Gucci, Tiffany & Co, Prada. 44 Curzon Street by Mansley has been welcoming Booking.com guests since 17 Dec 2014. When would you like to stay at 44 Curzon Street by Mansley? This apartment features digital TV with English and foreign channels, free WiFi and full cooking facilities. House rules 44 Curzon Street by Mansley takes special requests - add in the next step! 44 Curzon Street by Mansley accepts these cards and reserves the right to temporarily hold an amount prior to arrival. Please inform 44 Curzon Street by Mansley in advance of your expected arrival time. You can use the Special Requests box when booking, or contact the property directly with the contact details provided in your confirmation. Staff always friendly and helpful. Have stayed here many times. Always enjoy it. WiFi was very lacklustre. We also found black hair in our rooms/bathroom a few times, which goes to show that cleaning could've been better. Thin walls in this old building - when someone checks out early morning be sure that you will wake up before Sunrise as well. Poorly equipped kitchen. Loved the fact it was like a home from home. Everything was perfect so nothing we did not like. Its very outdated, quite dirty, has smell and not very well cleaned. Several times they forget to clean the garbage bins, there was dust, the bedding was not very nice. Old furniture, small and old style elevator and some light of the apartment were not working. The lady at reception wasn't friendly. No air-conditioning unit which as it was extremely hot in London the last few days was a disappointment However there was a large fan supplied so leaving the window open and the fan on we were reasonably cool!